The Quassy Amusement Park and water park in Middlebury, Connecticut have offered entertaining rides and games for the whole family since the 1950’s. Children’s rides include Kiddie Bumper Cars, the Frog Hopper, which takes riders 16 feet up in the air and then back down with a gentle drop, and the Boat Ride, part of the park’s original 1952 Allan Herschell Company Kiddieland. Also a Herschell original, the 1952 Kiddieland Sky Fighter ride lifts children into the air in a circular motion in two-seater jet fighters. Family rides allow adults to accompany their children on the rides. Among the Allan Herschell Company originals are the Little Dipper, a miniature roller coaster, and the Quassy helicopters, which take flight when the rider pulls back on the hand bar. A miniature locomotive, the Quassy Express Train, rolls through the park on a one half mile track. The train has been operating at the park since 1948. Additions from the 1970’s include the Tilt-A-Whirl and a Giant Slide. Recently added family rides include the carousel, The Big Flush Water Coaster raft ride, and Crazy Cups. 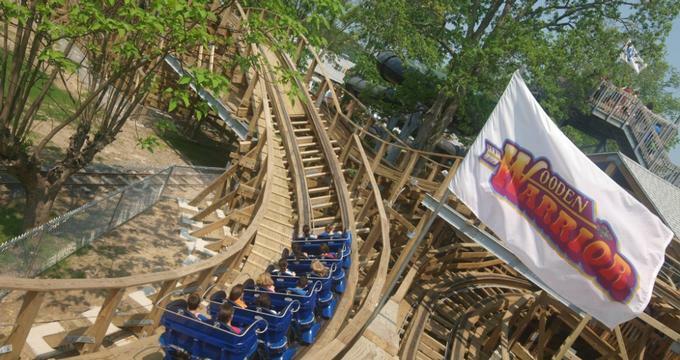 Thrill rides at the park include the park’s only roller coaster, the Wooden Warrior. Built in 2011, the coaster is the park’s marquee attraction, packing considerable airtime and steep drops into a relatively small footprint. Other thrill rides include the swinging Galleon Pirate Ship, the Yo-Yo Swing, and Reverse Time. One of the park’s newest attractions, Reverse Time, moves riders in all directions on a quickly moving platform illuminated with LED lights. Additional attractions include the Laser Maze, in which guests are challenged against the clock to cross a room crisscrossed with laser beams of light without touching a single one. An arcade is located on site as are a variety of carnival games. Water Wars has opponents facing off against each other with giant water balloon slingshots. Two-seat or four-seat paddleboats may be rented adjacent to the restaurant, allowing guests to enjoy Lake Quassapaug. At the park’s Splash Away Bay Water Park, guests enjoy a variety of attractions from the all ages Saturation Station, which periodically dumps a 300 gallon bucket of water on those standing below, to the FreeFALL Extreme Body Slides and Tunnel Twisters slides. Raft rides include the Bullet Bowl, and the Category 5 Rapids Raft Rides, which will open in the summer of 2018. History: Although the park officially opened as an Amusement Park in the 1950’s, Quassy, or as it was originally called, Lake Quassapaug Amusement Park, has origins dating back to the late 1800’s. Early Lake Quassapaug recreational activities attracted food and hotel services which catered to the fishermen who came to enjoy the lake. By 1908 hotels and a train line were servicing what had become a summer resort area. In the 1930’s several area businessmen invested in a resort property that had a swimming pool, carousel and picnic area. They added a tea-room, hot dog stand and roller skating, and in 1952, they purchased Kiddieland, a complete ride package built by Allan Herschell Company of New York. Many of the original Kiddieland rides still operate at the park today. Since the 1970’s, the group has been adding rides and expanding the park’s attractions. They still carry on the clambake tradition that dates back as far as 1888, at the lake’s first small boarding house. Ongoing Programs and Education: Quassy hosts school field trips for unique math and physics based educational programs. Wacky Science is a 25-minute interactive stage presentation. Laser 101 teaches about lasers and incorporates Quassy’s laser maze. Fun with Physics is a 1-3 hour program in which students explore the park accompanied by teachers and educational booklets that ask them to complete team activities. The Commotion about Motion introduces principles of gravity with the assistance of several of the park’s rides. Outside of STEM areas, a history tour incorporates the Park’s miniature locomotive, a photography tour invites children to explore the park with a professional photographer and learn how to take interesting pictures, and the ABCs About News teaches journalism through story telling. Groups may rent areas of the park for private gatherings, and receive discounts on rides and admission. The on-site Lakeside Caterers offer a variety of menu options for group meals. Annual events include Gospel Day, with music, food and fellowship. The Sunday Summer Bash is designed for groups of less than 150 to enjoy an all-inclusive day of attractions, swimming and meals.